Parents of child cancer patients who are being treated in the Hemato-Oncology ward in Hadassah Ein Kerem hospital, Jerusalem demonstrated Wednesday opposite the entrance to the hospital. The parents demanded that the hospital prevent the doctors in the ward from leaving the hospital in a month's time. 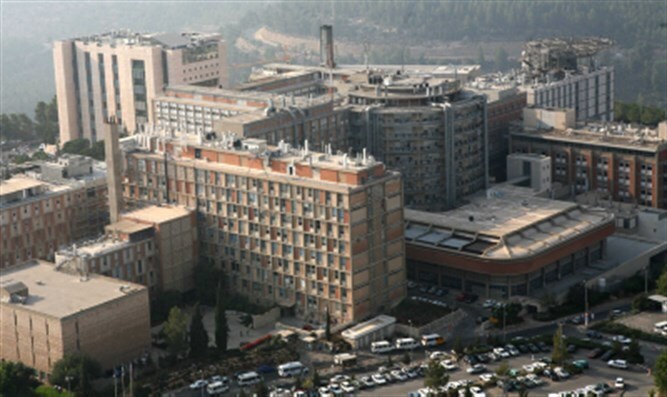 Shlomo Ben Dor, a resident of Gush Etzion south of Jerusalem, whose 6-year-old son is being treated for leukaemia, told Arutz Sheva that leaving children without an oncology department in Jerusalem is "nothing less than a crime." "There are doctors here fwho are among the best in the world, but they say that they cannot continue to work due to problematic medical conditions. According to the regulations every doctor is allowed to treat 15 patients but they are forced to treat 26 patients at the same time and they claim they cannot give optimal treatment. The doctors gave the hospital three months to solve the problem, there is just a month left before they leave," said Ben Dor. He called on the health minister to establish a new ward at the Shaarei Tzedek hospital which will absorb the doctors from Hadassah in a proper role, since "in Jerusalem there is only Hadassah for young cancer patients and if it closes there is no other place." "Hospitals in the coastal region cannot provide solutions for our children, because a cancer patient must be a maximum of half an hour away from a hospital. When an immune system is not working, every minute is valuable," the anxious parent said.